Remember all these brilliant forecasts and observations from Time’s Man of the Year? 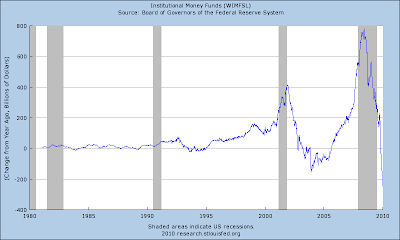 And we have experts who say time and again, “Don’t fight the Fed?” Give me a break. I will take the other side of the Fed any day. To say that they don’t know what they are talking about or doing is the understatement of the century. 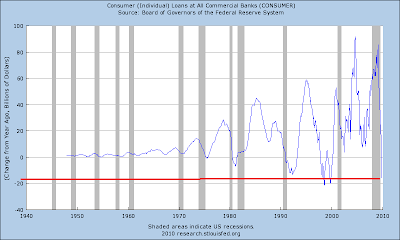 Debt saturation is the point where attempting to put more debt into the system results only in future defaults. 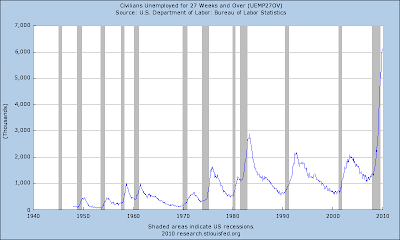 Once it is reached, it also results in higher unemployment. In other words, debt or leverage helps to grow employment up until the point that saturation is reached, and then it begins to work in the opposite direction because debt service prohibits real growth. 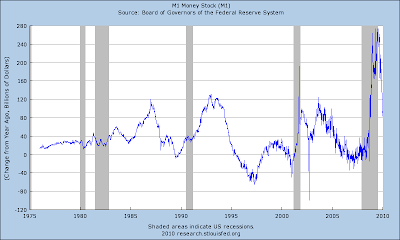 Each new up cycle produces more debt, recession follows, clears out the debt and allows growth to resume. But when you interrupt the debt clearing process, real growth cannot resume as incomes cannot support more debt and therefore cannot support more employment. 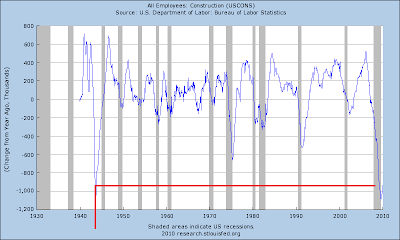 The following chart from Calculated Risk shows the current employment recession in comparison to all the others since the Great Depression. 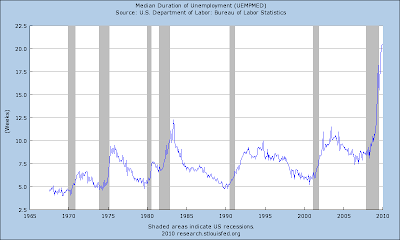 Did Bernanke see this coming? 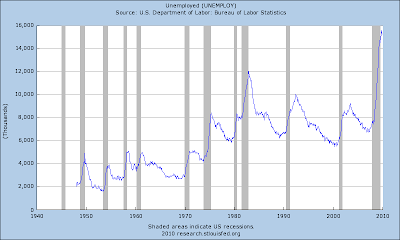 Bernanke’s own Fed produces the following charts. I’m assuming he has access, what do you think? 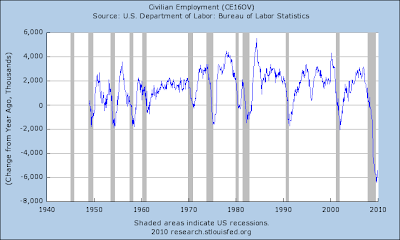 The following chart shows the change in Civilian Employment from one year ago. 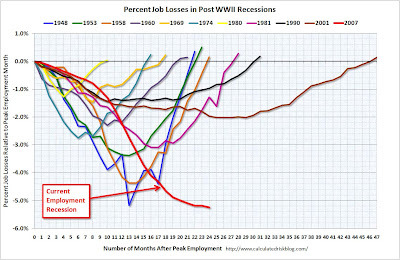 Still nearly 6 million have lost their jobs in the past year. 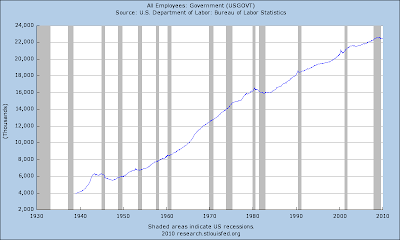 What is that claim about making jobs from Obama and his administration? Are they being truthful? 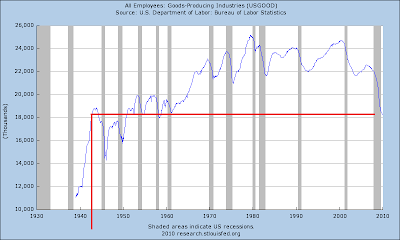 Amazingly, All Employees of Goods Producing Industries, this is all goods producing industries, now employ the same number of people as we did in the year 1943. 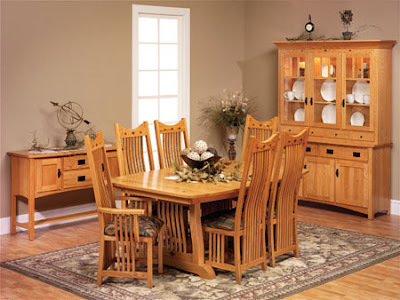 This is the actual number of people who make everything in the U.S.! This number is despite the fact that the population has more than doubled since that time! Yes, we are more productive, but we are importing way more than we export. 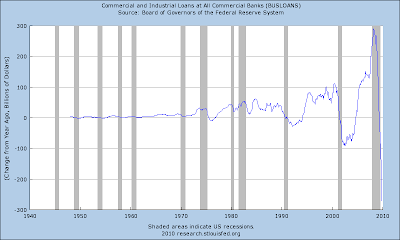 Our economy is completely out of balance and that’s because our economy is based on the printing of financial engineered products, not on real products. Can these trends continue? Can we be a nation that produces nothing but paper while we all consume real things made in other parts of the world? 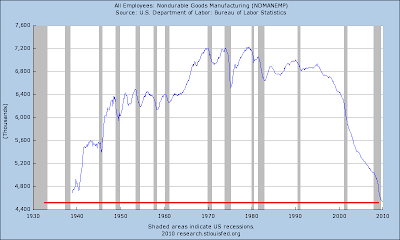 All Employees producing Non Durable Goods has not been lower since this chart began in 1938 near the height of the Great Depression. 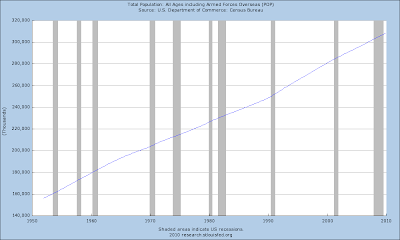 That’s right, our population has more than doubled and we employ fewer people making durable goods now than then. Do you feel like you’re living in a truly prosperous country knowing that? Think we will retain our wealth on that path? Did you know that Boeing, one of the largest manufacturers and exporters in America took in only 1 order in 2009 for every 10 they had in 2008? That’s a 90% loss in aircraft orders in just one year. That’s all history, though, right? We’re looking ahead to the future and it’s all good, buy stocks! So, in what area are we proficient at creating jobs? Oh yeah, I remember now… Comrade. Now, remember that all money, except coins, are brought into this system as someone else’s debt obligation. When you reach saturation and incomes can no longer support more debt, then pushing newly created money/debt into the system accomplishes NOTHING. It simply makes a round trip into a debtors hands and circles right back to the bank to pay off a prior debt. 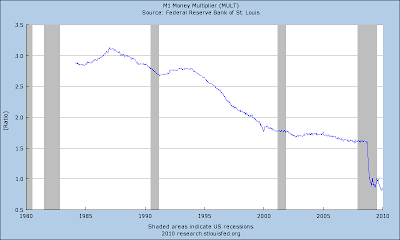 No velocity, no motion in the money, no motion in the real economy. 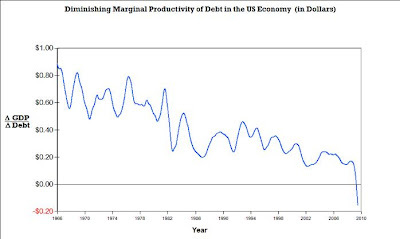 In fact, we are so saturated with debt that pushing new debt into the system actually is negative to GDP growth! 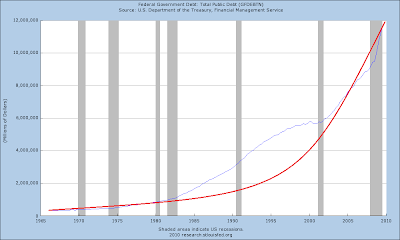 Each dollar of new debt SUBTACTS 15 cents from GDP! 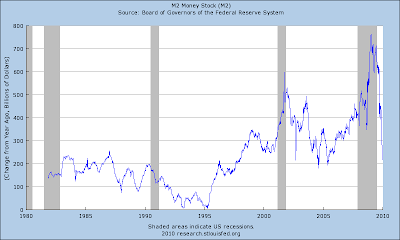 The U.S. Treasury needs to roll $2+ Trillion this year! Think about that. 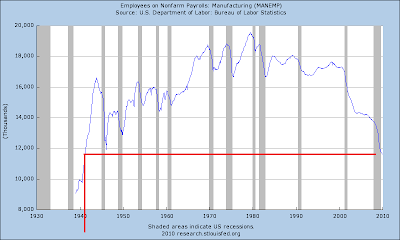 And now we know that Bernanke is talking about ending support programs. Everyone knows that should he pull the support that the markets will not stay up on their own. Many experts doubt he really means it and that he’ll find a way to force more debt into the system. That will not be a good thing, for sure! If he tries, he will simply push to the point that he finds the limits of government debt and he will irreparably damage the United States, as he already has. We have entrusted our nation to a group of fools who don’t even realize, I think, that they are beholden to thieves. They are so beholden that they lie, and manipulate to keep the money flowing for their master oligarchs. 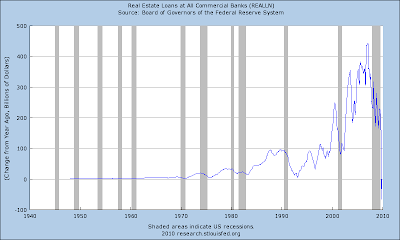 Real Estate loan creation negative for the first time since the Great Depression. The GSE’s now have their hand in 9 out of 10 residential home loans. What would this look like without that? 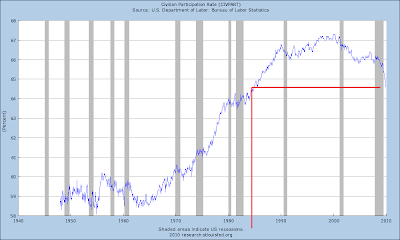 Let’s see… do you remember when they said that there was no housing bubble? 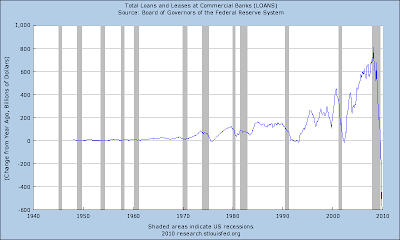 Then they said not to worry, subprime was all contained? How about when they were talking about “greenshoots?” And now what are they saying? 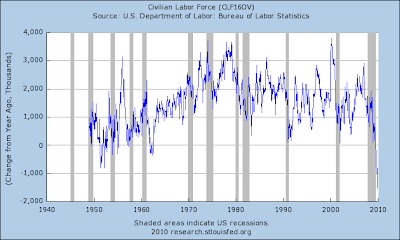 That the recession is over and we’re off to infinity? Riiight, play us some more… funky white boy.